After a fantastic time in Seoul, Byeongsu and I took the fast train south east of the country to the second biggest city - Busan. It's a 325 kilometre trip but only takes 2-2.5 hours if you take the KTX train. Busan has a more laid back feel to it compared with Seoul however it's still a big city with over 3.6 million people spread over a huge area due to the various mountains that are dotted around. It's known for nice beaches, hot springs, nature reserves and seasonal events. We stayed at Blue Backpackers Hostel in the centre of Busan which was clean, had good facilities and was only 25,000 won (~AUD$27). From there we spent the weekend exploring the city, local attractions & eating good food! 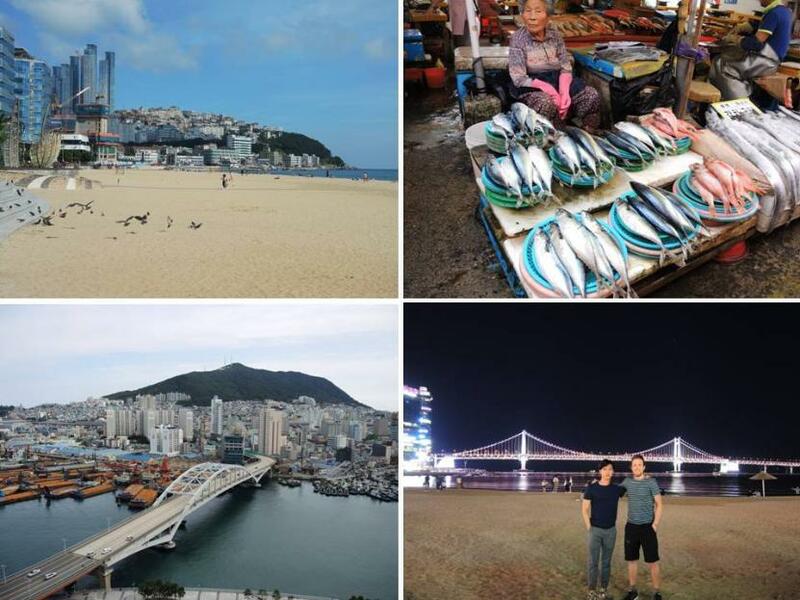 Haeundae Beach - A nationally renowned beach, that Korean's flock to in the warmer months. Haedong Yonggungsa - An impressive buddhist temple in Gijang-gun built in 1376 during the Goryeo Dynasty, right by the seaside. Gwangalli Beach - At 1.4km stretch of beach flanked by great cafes, restaurants and views of Gwangandaegyo or Diamond Bridge. Jalgachi Market - A fantastic market full of all kinds of fresh seafood. A must see. Taejongdae - A scenic natural park with rugged cliffs facing the open sea on the southernmost tip of the island - Yeongdo-gu. Late Sunday evening Byeongsu caught the train back to Seoul to go to work whilst I went to the bus station and caught the 50 minute bus to the next destination - Gyeongju.